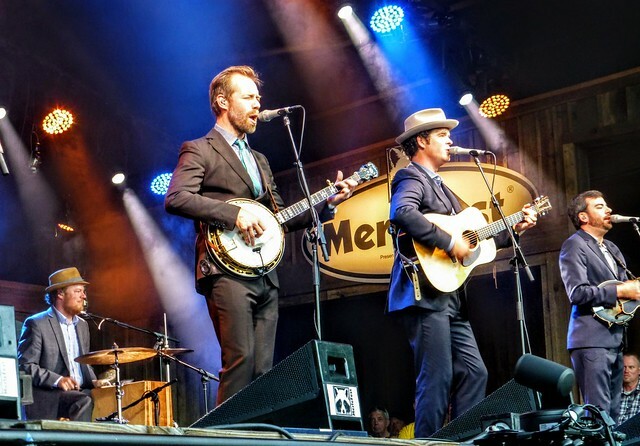 Posted on 01/28/2019 by Mark Engleson	in Live Review and tagged bluegrass, North Carolina, Steep Canyon Rangers, The Hamilton, The Hamilton Live. The Steep Canyon Rangers nodded to DC’s strong bluegrass history in a lively concert that showcased their unusual configuration and a few pleasant surprises at The Hamilton Live on Friday. Although the Steep Canyon Rangers won a Grammy for Best Bluegrass Album in 2012 with Nobody Knows You, that album does not mark the high tide of their success over nearly the band’s nearly 20-year career. Despite their Grammy-winning moment, the Rangers achieved their highest public profile for their collaborations with Steve Martin with Rare Bird Alert (nominated for Best Bluegrass Album) and their 2014 collaboration, Steve Martin and the Steep Canyon Rangers featuring Edie Brickell Live. While Nobody Knows You topped out at #2 on the Bluegrass Chart, their collaborative albums are among their six to hit #1 spot, including their last five releases. The Rangers have an unusual lineup for a bluegrass bland. As string music, bluegrass bands do not usually feature percussion. In 2013, the Rangers added Mike Ashworth, who plays a modified drum kit including multiple cajóns, a box-shaped instrument from Peru. This adds an international dimension to the quintessentially American sensibility of the Rangers’ music. The other members of the Rangers’ sextet include Woody Platt on acoustic guitar and lead vocals, Graham Sharp on banjo and lead and harmony vocals, Mike Guggino on mandolin and harmony vocals, Nicky Sanders on fiddle and vocals, and Barrett Smith on upright bass. Woody alluded to The Seldom Scene and The Country Gentlemen, saying, “It’s a good part of the world here for bluegrass in Washington, DC.” Legendary bluegrass picker Ricky Skaggs, who performed at The Birchmere earlier this month (See our Parklife DC review), was also part of the local scene in the ’70s. As the Rangers gathered around a single mic, Woody told the audience, “We’re gonna get close now, get intimate.” A hush descended on the sold-out crowd at The Hamilton as the Rangers played “Shenandoah Valley.” Woody told the audience, “We started this band around one microphone and all this stuff,” and the band played “Honey on My Tongue” before separating and inviting opener Kaia Kater to join them. Kaia, a Montreal-born, biracial Grenadian-Canadian Americana artist and banjo player, stood center stage with the Rangers for a song marked as “Bullet” on their setlist. Woody mentioned that this was the first time that Kaia had joined the band on stage. After a couple more songs, the band finished out their set to raucous applause and a standing ovation. In the packed pit, fans were dancing and hollering. The Rangers came back for a two-song encore, “Every River” and “Speed.” After the show, they proved extremely approachable, meeting with happy fans. By gracing The Hamilton with their fine music, the Steep Canyon Rangers certainly strengthened DC’s reputation as a place for bluegrass.